I am an avid fan of black eyeliner in all its forms - smudgy kohl liners, gel/cream liners, sharp liquid liners... you name it, I have tried it! 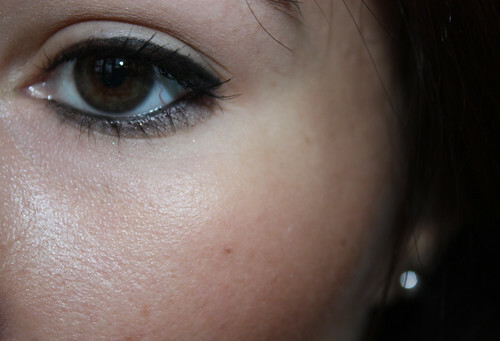 One category that I have been lacking in, however, has been the bottom lash line/waterline area. The soft kohl liners that smudge so well on the top lash line tend to migrate on me really badly and by the end of the day I've got myself a one-way ticket on the Panda Eye train. I've tried gel liner on the waterline and while it does stay on well, it's still a pain to apply and can't really be carried around for re-touching. It was time for something new and I had tried the entire MAC eyeliner arsenal at this point. Upon LisaLisaD1's recommendation I turned to Chanel. I know she has a lot of similar problems with eyeliner/mascara transferring so I figured her advice would be good to take. 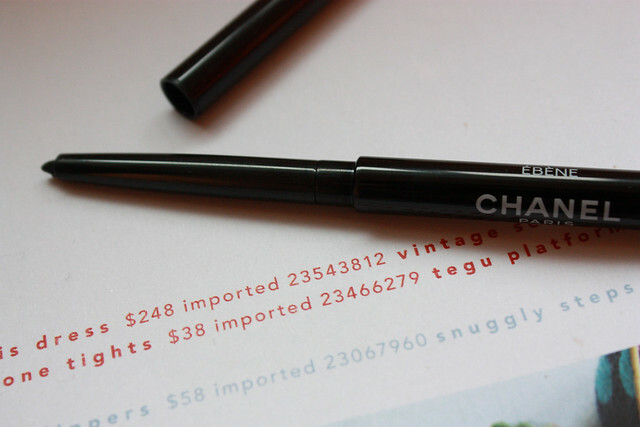 I purchased the Chanel Youx Waterproof Eyeliner in nr. 10 "Ebene", a basic black. It's in a plastic, twist-up casing and it has a little sharpener at the end (similar to the MAC Greasepaint sticks) which you can use to keep the tip sharp at all times. Application was very smooth - not as easy to glide as an Urban Decay 24/7 liner (which I wasn't crazy about, didn't last on me) or a Milani Liquif'eye pencil, but that's to expect from a waterproof liner with a harder consistency. Within a few swipes I was able to get the perfect coverage of black. It also took a few swipes to get it to show on the waterline yet it still wasn't an intense black - MAC Feline Kohl Power is amazing on the waterline but as soon as I apply it on the skin underneath it migrates even if I set it with a black shadow. It's fine for a dramatic smoky smudged look but not for anything subtle. *Note, I also didn't use any powder to set concealer under the eyes. We've got some fading on the waterline which is to be expected. It's been 12 hours with absolutely no re-touching so I'd say it's pretty darn good! We also have a bit of smudging towards the outer corner but it's not nearly as bad as the liners I was using in the past. I'm pretty happy with its performance so far and I'd like to try another colour, maybe a brown, next. The true test will be in the summer so I'll be sure to keep you updated if I repurchase it. Do you have any go-to liners for the bottom lash line? 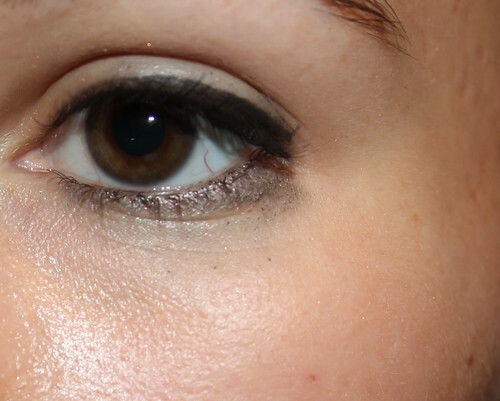 Or are you blessed with little transfer/panda eye problems? PS: I'm leaving for Toronto later today and won't be around on the weekend. I have a couple of posts scheduled to go up while I'm gone. I hope you all have a great weekend!